Remember how I mentioned that I was going to try straw bale gardening this year? 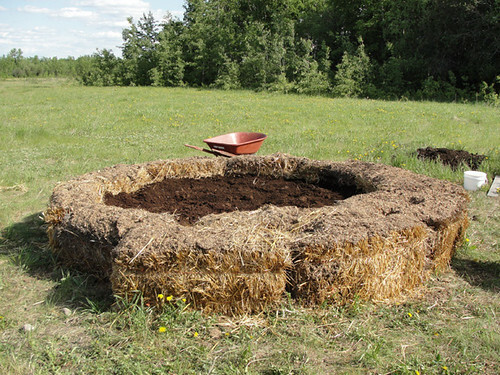 A perfect way to get an "instant garden", while doing something with the ratty straw bales that I used to winterize my chicken coop with, thought I. Well, it just keeps getting better. After circling up the bales, the boys covered the top with composted chicken litter from the winter (one more "waste item" getting put back into use! ), and drenched the whole thing with water to kick-start the composting process. A week later I managed to dig and pull and chop most of the weeds out from the middle, and in between battling mosquitoes I had time to think what a waste it was to just be throwing that valuable greenery over the side to smother the wild strawberries. 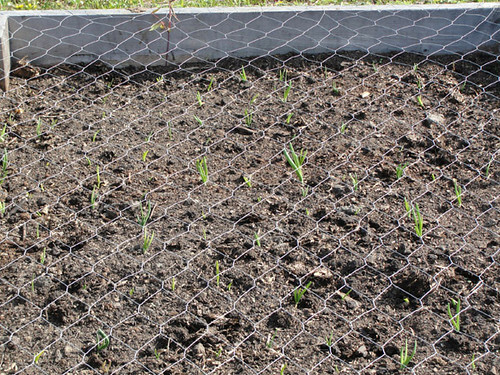 That night, while I was reviewing the ins and outs of straw bale gardening on this site, my eye was caught by another link called "lasagna gardening." (Wouldn't you be curious how pasta and meat sauce works into the garden?) Well, by the time I had read that page, I knew what I was going to do in the middle of that straw bale garden. 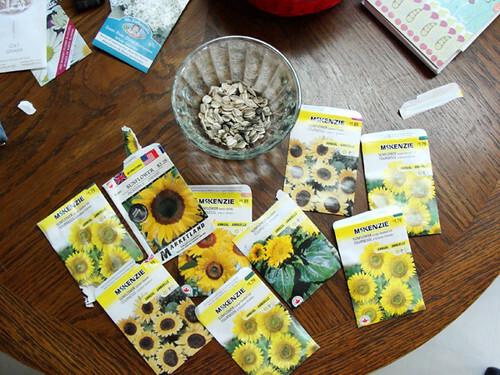 My original plan had been to dig out the weeds, throw in some sunflower seeds (which I have been collecting for years, because apparently I have many good intentions when it comes to flower gardening, and am a little short on follow-through) and see if any of them grow. I wanted to clean out my seed drawer and start fresh, and I knew most of them would likely not germinate anyway, due to their age, so what difference did it make? However, I really liked the idea of sheet composting the middle section of the garden. For one, it would help the straw bales retain some moisture. For two, it would give me a good start on some nice, rich soil, and the beginnings of a permanent, rather than temporary, garden spot. For three, it would help me use up some stuff that was laying around the yard. So, in went the layers. Ripped-up cardboard boxes, followed by all those weeds (and then some) that I had dug out the night before (Yes! I actually put weeds into my garden! 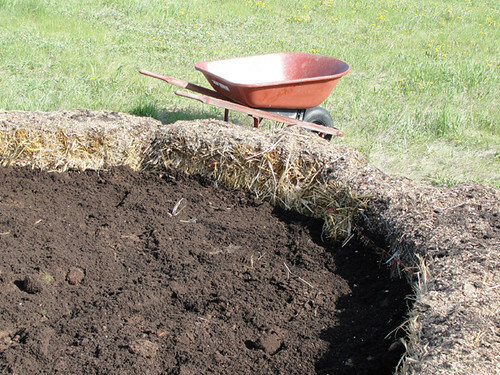 ), followed by a layer of composted chicken litter. Several days passed before I was able to progress from there--days involving rain, and snow, and wind, and coldness. Sunday afternoon was bright and sunny, and I knew I had to finish the job before the growing season got any shorter. More layering commenced: partially-decomposed compost from the bin (collecting since last summer, but some of it was pretty fresh); partially-decomposed straw from the dogs' winter bedding; extra bags of peat moss that were laying around, full of holes and ants (the peat moss and ants went in, not the bags); some potting soil in a thin layer on top. After that, I mixed all my sunflower seeds--old and new--together for the official scattering. The boys and I each took a handful and threw them in--the result was covering a rather smaller area than I expected that many packets of seeds to handle. 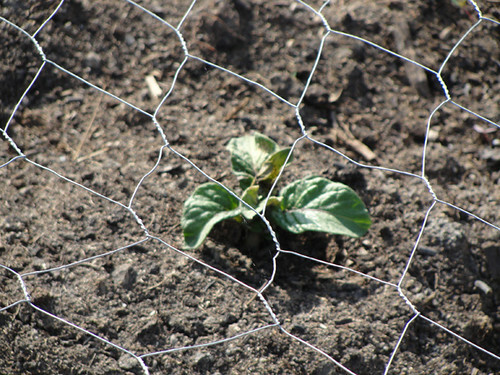 A bit anti-climactic, since I had been promising them they could help me plant sunflowers once I got the garden ready. Oh, well. I filled in the rest with daisy seeds. Then I planted as many other flower seeds as I could around the straw bale edges, leaving a few spaces to insert tomatoes in a week or two when my plants indoors are ready to move out. Will anything grow? I don't know. It would be nice if it ALL grew, but right now, I am just kinda excited to see what will happen. 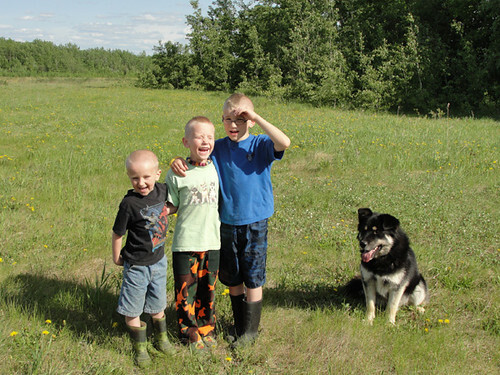 Gardening assistants? Well, three out of four, anyway. The hairy one mostly likes eating the fertilizer! LOVE those gardeners!! Ummm.... well, the hairy one not so much. But he's OK, too.